in-store point of purchase display or trade show booth? Our team can work with you to produce your display transparencies and photographic prints up to 4'x10' on a wide variety of materials including canvas, vinyl or backlit transparency. We can mount your images in sections or ship in rolls for installation on site. Display transparencies are used for back lit displays. These types of images make excellent point of purchase displays and trade show exhibits and are made from negatives. We can output negatives from your digital files as well. Murals are large photographs printed on semi-matte paper from negatives. These images, combined with mounting and laminating make great displays for point of sale displays or trade show booths. Dpi can mount murals for your decorating needs as well. This print material is polyester based and is not made for back lit display. It is strong enough for applications such as trade show booths or point of sale displays. It is great to roll up and use for traveling displays when combined with lamination. When preparing images for Display Transparencies (Dura-trans) for the Wichita Mid-Continent Airport, please make a 200 DPI image at the size of the display. The image file should be saved as an RGB TIF with no layers or paths. Files can be compressed using LZW or JPG at the highest quality (minimum compression). When you want an image really BIG, such as 16' x 60', or even larger, then this is the way to go. 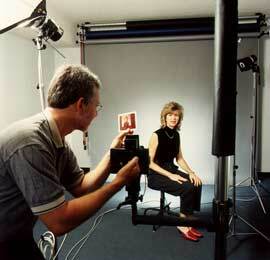 Even composite images can be enlarged with the process to handle those really special jobs. Vinyl Murals are made using the latest computer technology, digitizing your final image and creating a reproduction on vinyl that can be heat spliced when necessary to make an image any size needed! We have samples available.